Our final day was a wine lover’s dream. 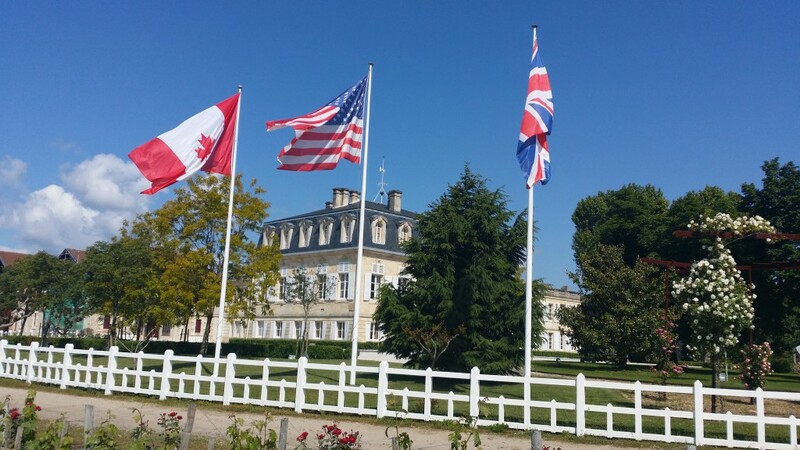 We arrived at Château Pontet Canet at 11 am and immediately noticed three flags had been put up in honor of group members hailing from Canada, England, and the US. We took a walk around the vineyards with the English-speaking guide and then tasted four wines (2014, 13, 12, and 11 – but not in that order) with Alfred Tesseron and estate manager Jean-Michel Comme. I actually preferred the 2012, followed by the 2014, the 2011 and the 2013. Then it was time for lunch. And what a lunch it was! 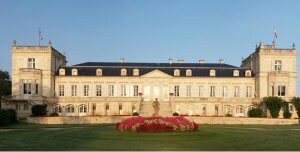 Drinking 2003 Dom Pérignon in the château salon was a very good kick-off. Then all 18 of us trooped to the formal dining room where Alfred Tesseron held court, despite feeling somewhat under the weather. The 2000 Pontet Canet is ready to drink, which is the case with many wines of that vintage despite what you may have heard. The 2003 is a somewhat controversial wine, but it showed very well – not too big, although a little raisiny. Alfred Tesseron says that appearances are deceptive and that it has a long life ahead of it. The 2005 was not quite up to the vintage’s reputation in my opinion. 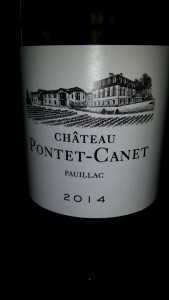 One of the group members had brought a 1962 Pontet Canet purchased at auction years ago. Alfred Tesseron went into his private cellar and brought out a bottle from the same vintage so we could compare. In fact, the wines were not far apart, and I actually preferred the one that had been trundled many miles and stored less than perfectly. 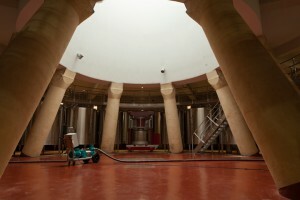 Afterward, we drove to Château Ducru Beaucaillou, where cellarmaster René Lusseau took us around. 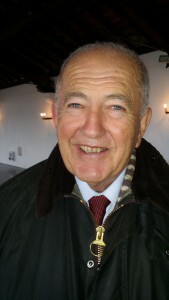 He is a true product of the Médoc and translating his puns and local references was no easy task. We visited their semi-underground cellar and went on to taste three wines. 2011 Lalande Borie was a little one-dimensional, but good enough. 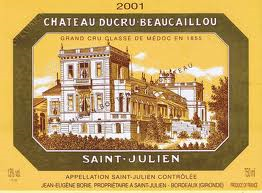 The 2008 La Croix Beaucaillou was showing a little too much oak, and the 2001 Ducru Beaucaillou was at its peak – which makes me think it is high time to start opening the fine wines in my cellar from that vintage. 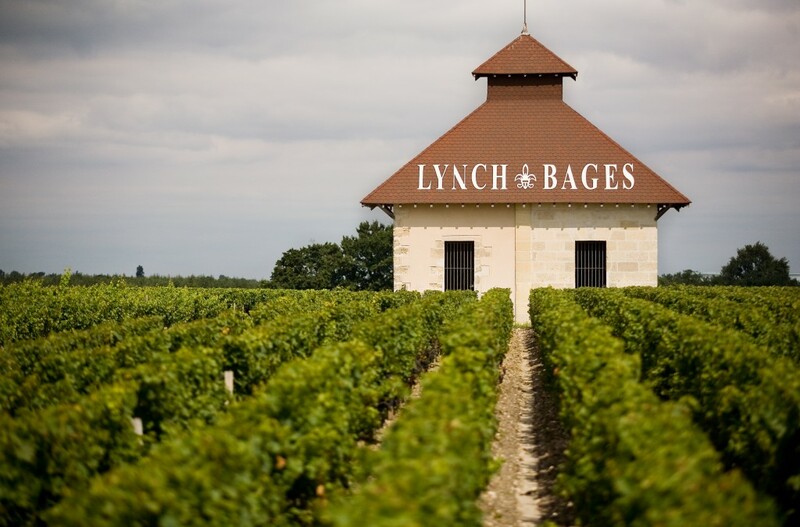 Our next stop was at Lynch Bages. This estate is very much into wine tourism. Not only do they receive visitors easily, including on Sunday (a rare phenomenon in Bordeaux), but the Cazes family has also established a little hamlet nearby with a restaurant (Café Lavinal), baker, butcher, and gift shop. We received a standard tour and then tasted several wines from the Cazes stable, starting with Les Ormes de Pez, Echo de Lynch Bages, and Lynch Bages from the 2014 vintage. 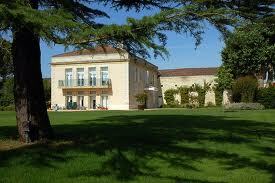 Unsurprisingly, Lynch Bages was the star here, with the château’s trademark blackcurrant fruit. 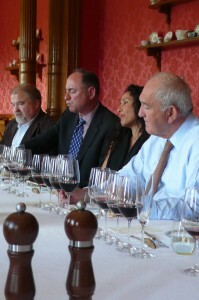 We also tasted 2007 Ormes de Pez and Lynch Bages, neither of which left a particularly fine impression. 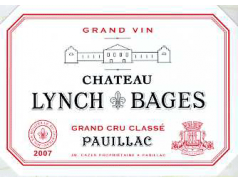 We finished with the 2014 Blanc de Lynch Bages that displayed a very fresh varietal (Sauvignon Blanc) nose and a considerable amount of oak. 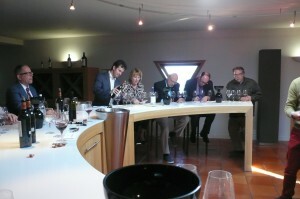 Prior to dinner, Nicolas took us through a fascinating tasting in one of the best equipped tasting rooms I know. It was also quite appreciable to be able to sit down by this point! 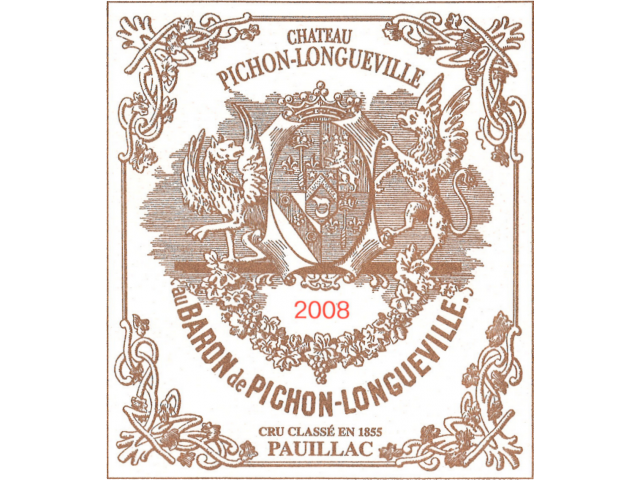 We sampled 2014 Pibran and then 2014, 2010, 2009, and 2008 Pichon Baron. I think Pibran is one of the best value wines in the Médoc and was therefore not surprised to enjoy the 2014. All the Pichons were top-notch, and I was especially taken with the 2008. The others may be intrinsically better, but they need a great deal of time to come together, especially the 2010. We went from the tasting room to the château, where we were immediately served a glass of Jacquesson Champagne (I believe it was the 735, but why in the world do they give their wines numbers instead of names?) and invited to walk around and admire the beautifully decorated rooms and antique furniture. Then it was time for a formal meal in the lovely dining room. The following wines were served: 2012 “S” de Suduiraut (a dry Sauternes), 2004 Pichon Baron, 2003 Pichon Baron, and 1988 Pichon Baron. The white wine was perky and nice, more attractive than serious, and probably best enjoyed young. The 2004 Baron was a little weak on the middle palate, a tad dry, and still youthful. The 2003 once again belied the preconceived notion that the wines of this vintage are top-heavy, overly alcoholic, and flabby. 2003 Pichon was certainly rich, but not outrageously so, and had good acidity. Very pleasant. 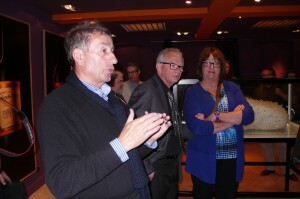 The 1988 was served blind and correctly guessed by one of the group members who had bought cases of the wine. It was “à point” and a wonderful way to end the series. A silky, aromatic 2005 Suduiraut was served with dessert. 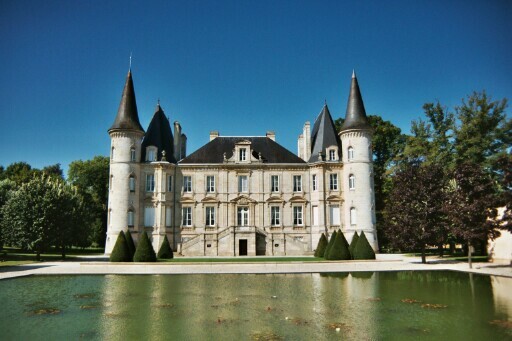 We left the château replete, tired, and extremely happy. 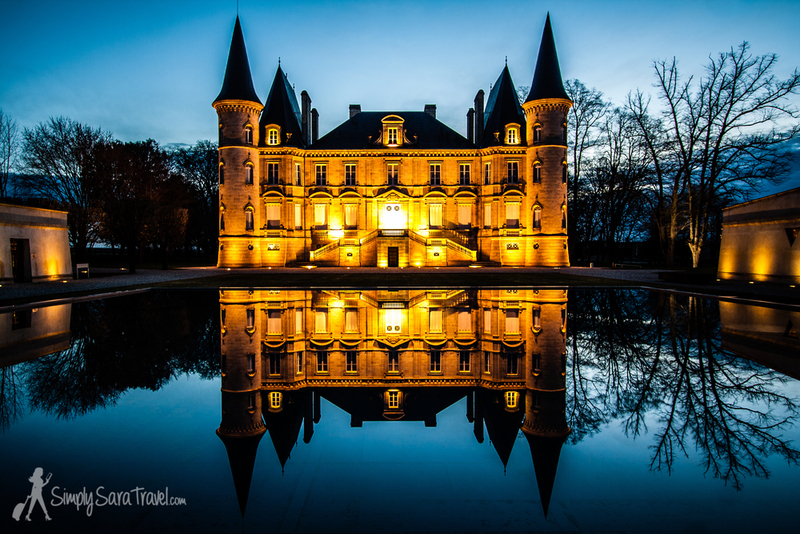 Looking back at the floodlit château and its reflecting pond, we were filled with admiration for the majesty of the great wines of Bordeaux, as well as the genius of the Bordelais in linking their wines with magnificent structures such as this. 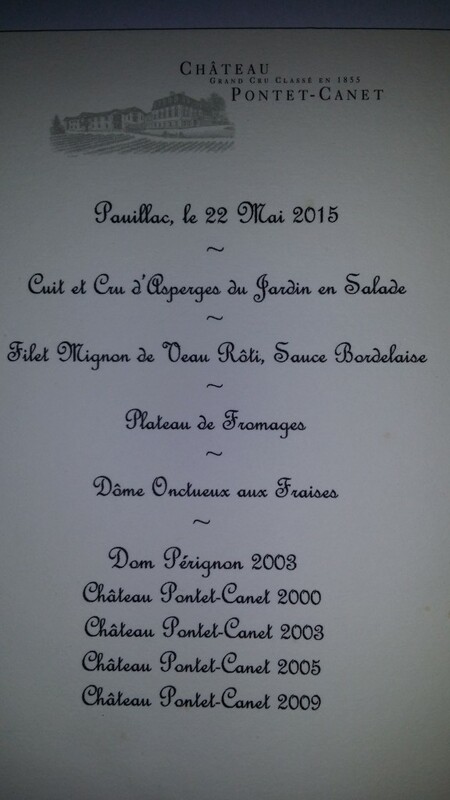 Posted in Uncategorized and tagged Bordeaux, Pauillac, Pontet Canet on May 27, 2015 by AlexR.